ISOLATE® SWITCH OFF YOUR EARS! Revolutionary ear protectors that isolate you from sound like never before. So the new Flare Audio Isolate range, pretty little things aren't they. There are 3 options in the collection ranging from very affordable upto designer that you can choose to receive in either gold or rhodium. But still they all do the same important job, protect your hearing from dangerous sound levels. But these are different, unlike other ear plugs on the market they actually block all sound. So how do you hear anything????????? Well from what I can't understand in my non scientific brain is that they actually use bone conduction. It all sounds very technical. We have developed the patent-pending technology, produced various prototypes and tested ISOLATE® in many ears (including gaining independent reviews and endorsements which are shown below). We have tested ISOLATE® out with dozens of users and on in-house test equipment which has shown staggering attenuation results. • Protect your ears against permanent hearing damage. • ISOLATE® is not like any other ear protector; it blocks direct sound from entering your ears including bass frequencies without any batteries or annoying re-charging. 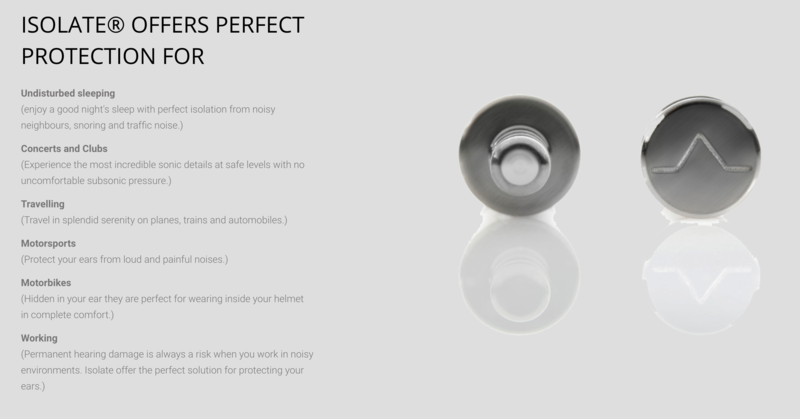 • Revolutionary Ear Protection for Music, Travelling, Sleeping, Motorcycling, Motorsport. • ISOLATE® reduces noise levels but still allows you to hear details in sound through bone conduction. • Each ISOLATE® set includes a pair of replaceable small, medium and large EARFOAMS®. • Additional replacement EARFOAMS® are available below. Under 75dB your ears are safe. But continuous exposure eight hours a day to noise over 85dB will damage your hearing permanently. A blast of noise over 110db for two minutes can cause irrevocable damage to your ears immediately. It's not uncommon to experience pain or ringing in your ears or even temporary deafness after short exposures. Usually this passes after a while but a number of situations which can illicit this effect may be more numerous than you might think: Safe level: A quiet room at night 20 dBA, an ordinary spoken conversation 60 dBA, or even a city street 70 dB(A) pose no threat to your hearing. The damage threshold is at 85dB. A Noisy restaurant 90 dBA, a Pneumatic drill or maximum volume on some personal audio players 100 dBA, a night club 110 dBA, rock concert 115 dBA or an aeroplane taking off 120 dBA could damage hearing. If these are environments you experience regularly, some protection is recommended. Sometimes wearing ear plugs are an obvious solution. Shift workers, musicians, hyperacusis sufferers(hypersensitivity to sound) and the partners of snorers are all too familiar with resorting to blocking out unwanted noise in this way. On other occasions, though it may seem counterintuitive to use them. At a concert, you want the full-on DJ Equipment music experience, yet time spent in front of loudspeakers filling the space with sound will leave your ears ringing for hours afterwards - an early warning of the damage such exposure can cause. You may love the roar of your motorbike, or maybe work with loud machinery or power tools and need to keep fully alert to what's going on. But all these environments can be detrimental to you hearing in the long term.